View More In Antifreezes & Coolants. 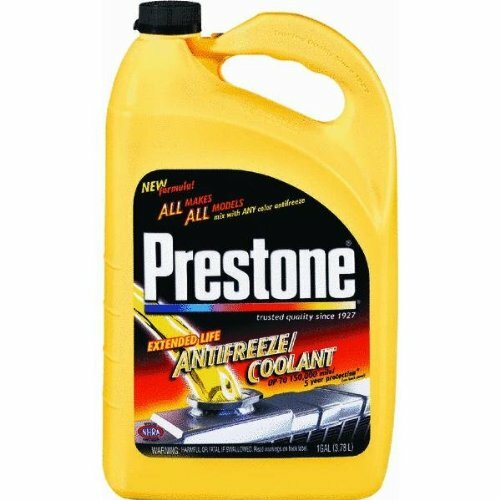 Prestone Concentrate Antifreeze/Coolant is the ideal solution to help your engine last longer. Fortified with the new patented Cor-Guard improved extended life technology, Prestone prevents corrosion and helps keep your cooling system running more efficiently. Keep your entire cooling system, including your radiator and water pump, free from the damaging effects of worn-out antifreeze. Use Prestone, the antifreeze specifically designed for the sophisticated engines in today's cars and light-duty trucks. Gallon Ideal solution to help your engine last longer Fortified with the new patented Cor-Guard improved extended life technology Prestone prevents corrosion and helps keep your cooling system running more efficiently Keep your entire cooling system, including your radiator and water pump, free from the damaging effects of worn-out antifreeze Use Prestone, the antifreeze specifically designed for the sophisticated engines in today's cars and light-duty trucks For any car or light-duty truck. Works with any color antifreeze Up to 5 years or 150,000 miles of protection. If you have any questions about this product by Prestone, contact us by completing and submitting the form below. If you are looking for a specif part number, please include it with your message.